Red diamonds are the very rarest of their kind, and to see them set in a ring means that the ring is doubtlessly very, very expensive. Red is fiery, passionate, brave, strong and more – everything you had desire in love. It is also the color of your lifeblood, the one thing that keeps you alive with help from your heart. Red is consequently, unsurprisingly, the color of love. Red diamonds are so rare because they only happen due to a structural anomaly caused by plastic deformities when their crystals are still in the process of forming. They are Type IIa gems and constitute a mere 1.8% of all diamonds found. However, an overwhelming part of that minute number was mined in Australia. Argyle Mine, to be exact; it is the source of many diamonds supplied worldwide. Unlike white diamonds, or any other diamonds for that matter, the asking price for red diamonds can be as unpredictable as it is astronomical. Because so few are in existence and even fewer never had a previous ownership, they fetch almost-unworldly prices that are far beyond the reach of the average citizen. As expected, only billionaires and a smattering of millionaires can play this game. As of April 2010, only 60 red diamonds have found owners, making the possibility of finding a red diamond ring even rarer; one would have a much improved chance aiming for a diamond with a blush of pink. If you think you have a deep sufficient pocket and would like to give red diamond hunting a try, you will often find that information on it is scarce. This is, in part, due to the sheer infrequency of the gem. It might also have something to do with the detail that Argyle withholds information about its red diamond buyers. 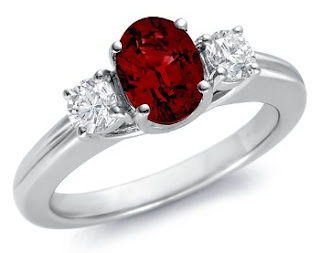 There are a few things that stay constant regardless of a diamond’s availability, though; these can be used to judge the red diamond rings that you wish to buy, even if you are hard-pressed to find specific information about it online or offline. Australia’s largest, natural pink diamond, The Argyle Pink Jubilee, was discovered recently, at Rio Tinto’s Argyle mine in Western Australia, where it is said that 90% of the world’s natural pink diamonds are found. But it was not just this diamond’s gorgeous pale pink colour and exceptional size that caught my eye – the extremely rare 12.76 carat stone is estimated to be worth at least £7 million! Scientists in the diamond industry have discovered a variety of techniques which may change a low graded yellowy –brown, cut and polished diamond into a colourless or fancy coloured diamond which are so desirable in the jewellery world. Initial methods, such as radium treatments, modified the colour of diamonds but left diamonds highly radioactive, to the point where the diamonds would be a danger to wear; however technologies have moved on a great deal since then. There are now much safer ways to change a dull diamond to a dazzling colourful stone. There are many ways in which the diamond industry is treating low graded diamonds; there are safe forms of irradiation, diamond coatings, as well as high-pressure high-temperature treatments. But the technique that our diamond dealers use, combines electronic beaming and heat treatment to alter a diamonds colour, and is seen as a mechanical simulation of how a diamond is created in nature. The electronic beaming changes the atomic structure of the diamond, whilst the heat treatment fixes the colour, and this way of treating diamonds is 100% safe and non-radioactive! Different diamonds, timings and temperatures can affect the colour that the diamond turns into. Dull brown diamonds can turn a stunning sky blue or cognac colour, whilst murky yellow diamonds can turn into a vibrant yellow or green. There is also a 1% possibility that these yellowy diamonds will turn pink, theoretically making the production of heat treated pink diamonds a fault! Due to this, the supply of heat treated pink diamonds is very hard to control. This delicate platinum ring, holds a 0.27ct, pear cut, treated pink diamond, and is a striking example of how an initially unappealing stone may be turned into something amazing! Getting ready to propose to your future wife is an exciting time. You want to make an everlasting and powerful statement by checking out all available options for a gorgeous princess cut engagement ring. For generations and generations man has acquired his wife by offering a ring making the couple engaged showing a strong commitment and dedication to one another. Before getting down on one knee you want to make sure you find the finest ring that your wife to be deserves. It is important to learn as much as you can about diamonds and diamonds jewelry before purchasing your very rare and beautiful princess cut engagement ring. Knowing the 4C's will give the best chance of purchasing exactly what you want. Engagement rings are a lifetime asset. Even though you will be spending a lot of money on this engagement ring you want to be sure to get something that fits her personality and most prominently her style. 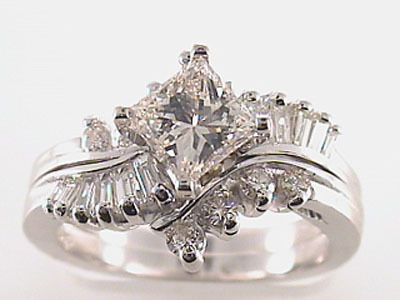 Beautiful princess cut engagement rings can be available in many jewelry stores, antique stores and online. When shopping approximately be sure to compare prices from all the different dealers. Having knowledge will provide you the advantage of insuring you will not be ripped off. Most jewelry stores you will be able to find common styles as well as common prices, this is not to say a jewelry store is no good for shopping but it can be very expensive. Be sure to have your budget planned out. 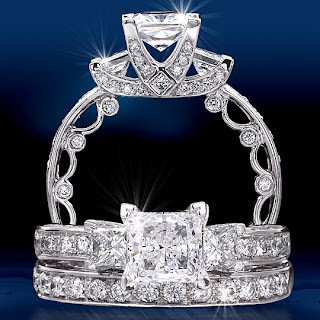 Online stores are able to offer great prices on beautiful princess cut engagement rings as well as make customizations. Customizing your beautiful princess cut engagement is a great choice as this will insure that your partner gets exactly what she has been dreaming of her entire life. Before making any purchase of your beautiful princess cut engagement ring you want to make sure you are purchasing from reliable source. Find out how long the company has been in business for and if they are trustworthy at all. Beautiful princess cut engagement rings come in all sorts of settings. The most traditional is the solitaire setting, one stone placed in a solitaire setting. Engagement rings with side stones and complicated metal work can also be a great choice. Some people like to purchase their beautiful princess cut engagement ring together with a wedding band. When purchasing it together it is known as bridal sets. Bridal sets are a great way to save money because you are getting both rings at a far better deal than purchasing them separately. Finding a gorgeous engagement ring for your wife to be is a fun and enjoyable task. Antique shops you may be able to find a really rare and beautiful princess cut engagement ring for a reasonable price. Sometimes you may find a great engagement ring, but just remove the stones and customize a setting to place the stones in. No matter what you go with it is the symbol of love and dedication that will make her say yes. Oval diamonds were first cut in early 1950's. The oval diamonds were prepared as a mix between Round cut diamonds and Marquise shape diamonds. One of the leading diamond cuts in fancy shape diamonds, Oval diamonds have for all time been very popular with women seeking alternate engagement rings. However in the last decade, Oval engagement rings have become more mainstream and oval diamond engagement rings are currently popular with women everywhere. "Oval cut diamond engagement rings were always very popular with women who wanted something extraordinary, however with many celebrities showcasing their engagement rings with oval diamonds, Oval engagement rings have become more mainstream", says Mr. Mathew Bruno. While the complete collection of Oval diamond engagement rings, showcases Oval cut diamonds, however customers still have lots of customization abilities to design the engagement rings to their preferences. Customers can choose between different gold choices like White gold engagement rings and yellow gold engagement rings. Few of the very popular designs can also be modified in rose gold, and customers can get their rose gold engagement rings with oval cut diamonds. Customers would also be able to change the gold purity of their engagement rings, with most of the engagement rings available in 10k, 14k or 18k Gold options. One of the major attractions of the new oval diamond engagement rings collection is the cheap and reasonable prices of the entire line. 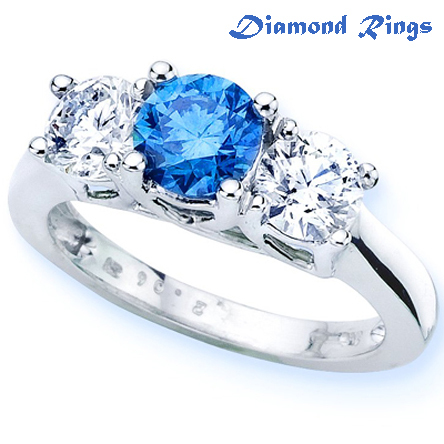 These Oval diamond rings are currently available on sale prices and customers can find many deeply discounted oval diamond rings at very cheap and affordable prices. Most of the oval diamond rings are however available in limited quantities and as such many designs have already been sold out. Colored diamonds are becoming a new style in several ways. They are a relatively fresh concept, with some stones ranging from white to yellow and others tinted blue or pink. While the blue diamond’s have a manly touch, the pink diamonds have a more feminine appeal. Generally they are designed for women of all ages and backgrounds. They are commonly mounted on a band of gold or silver, so as to not distract from the brilliant coloring in the stone. These pink diamond gems will be used for several purposes. They are stunning accents that look great with a casual outfit but they can also be made in an engagement style. The bands are also customizable in their design. Some may be textured and etched while others are the classic smooth band. The most textured of the bands is a rope style. Several smaller ropes are injure together to create one singular band. The stones themselves occasionally take on an imaginative air. They are sometimes created into square, ovals and ovals to emphasize their luster, cut and color. A nontraditional prong-free mounting is available as well. 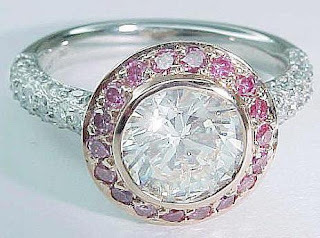 There are numerous options available concerning style for these pink diamond rings. They can come in modern, traditional or classic designs. When choosing the vintage style the tops are going to be bigger and more embellished, on occasion using other stones of smaller size. A modern ring design is more likely to be in an attractive shape combined with an intricate band. It is becoming more and more general to use abstract visuals when designing modern rings. 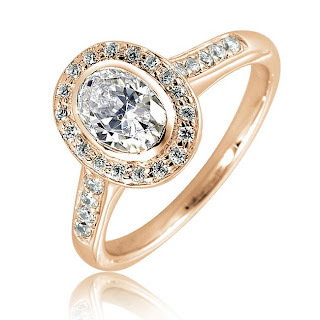 When it’s set with other, smaller, stones it becomes more of a classic or engagement style. 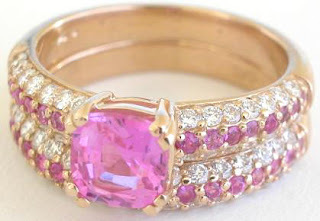 Normally the two smaller stones are white or of a similar color, set right next to the pink stone. This is the most typical of wedding or engagement style rings. These gems are available in the similar cut designs as their colorless counterparts, but they can also be custom ordered for shape and style. The most frequent styles are, the princess, teardrop, square, and oval cuts etc. Custom made cuts are more luxurious, but make more of an impact. The bands can be platinum, yellow or white gold, and sterling silver. As with most other gems and metals they are sold by the combined weight of both the gem and metal. 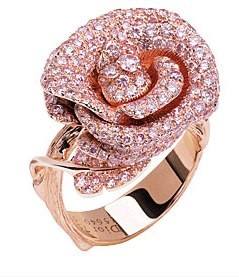 Anyone wanting to make a statement with their jewelry will find the perfect match in a pink diamond ring. Asscher engrave diamonds have been in continuation for larger than a century. Asscher incise diamonds are a unite among princess engrave diamonds and egg-shaped shaped diamonds. As such Asscher cut diamonds include a tetragon core with smoothed corners. These believe cut diamonds were slow to rise in reputation, as their procedure was on the whole partial to exceptionally high end time meeting rings. The engagement rings album on its website for the inventive summit. The Asscher cut date rings album is geared towards clients who are looking for exclusive Asscher cut diamond settings at reasonable and shameful prices. Asscher cut diamonds are more of an acquired taste as these are not conventional diamonds. Asscher cut diamond rings would feature very unique engagement ring settings such as Asscher cut Halo engagement rings, and antique Asscher cut engagement rings. Since nation are used to bearing in mind Asscher cut diamonds in very conventional settings, they inactive rather to acquire these diamonds with the identical conventional scenery designs. Consumers will be intelligent to prefer from 1/3 carat to 1 carat Asscher incise diamonds. Customers will in addition be intelligent to adapt the Asscher cut diamond rings on unlike gold metal types such as ashen gold, yellow gold and rose gold. Customers to mean their own Asscher cut diamond charms to their hold exclusive preferences; it would enlarge buyer contact on the website which would lead to more purchases. Customer’s canister wish from above 100 unusual styles of wedding sets and diamond necklaces and they can advance adapt them to their own preferences. If you know some interesting facts about precious stone bracelets, it would make you appreciate their scarcity and exquisite twinkle beyond the looks. Apart from being the most beautiful and common diamond, precious stone has a wonderful past and that makes it particular choice as wedding happens to be enhancing the particular finger. Basically the term ‘Diamond’ has derived from the Greek concept adamas, which means unconquerable, unbreakable etc. 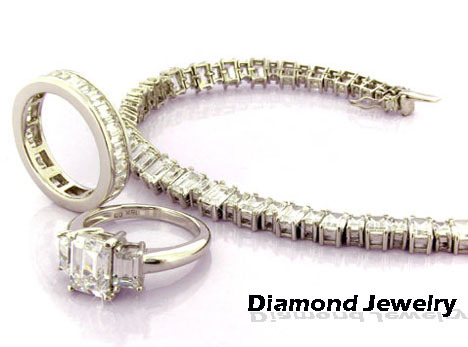 Diamonds are considered to be one of the hardest ingredients on earth and they are very durable. However if not handled properly even a well cut gem can be damaged or damaged. Diamonds are natural ingredients that are established under tremendous stress and warm deep beneath the Planet's brown crust area. Rough precious stone bracelets are brought to the surface as a result of volcanic activity. They are also revealed while exploration old volcanoes. There are some very scarce precious stone bracelets that are established by meteorite has an effect on that generate sufficient stress and warm to crystalline carbon. Diamonds can be cut and attractive into a variety of designs due to its mathematical clear lattice. The most common shape would be the round diamond; however princess, emerald; square and marquise designs are also common choices for wedding happens to be, wedding happens to be and Diamond bracelets. Most precious stone bracelets have some quantity of toxins and pure pristine precious stone bracelets are exceptionally scarce. Nitrogen is the most common impurity found in precious stone. The diamond reaches a brown or yellow coloring as nitrogen is added to the clear lattice and depending on the quantity of nitrogen and its concentration, large of the precious stone would be determined.